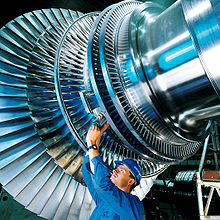 A steam turbine is a machine that gets thermal energy from pressurised steam. It uses the energy to do mechanical work by rotation. It is usually connected to a generator to produce electricity. The heat to produce steam comes from burning a fuel such as coal, from burning trash in an incinerator, from the waste heat of other industrial processes, from a nuclear reactor, or from a natural source such as sunlight or geothermal heat. There are many sizes of steam turbines, from small ones (less than 0.75 kW) for pumps and other devices, to larger ones (1,500,000 kW) for producing electricity. This page was last changed on 3 June 2018, at 05:16.